Robot Reports works with Robot Save to archive its reports. 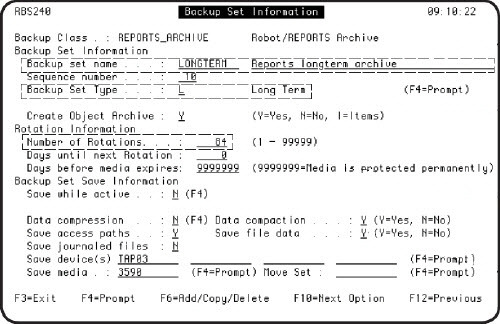 Robot Save includes a backup class usage type designed specifically for the Robot Reports archive. The backup class and its associated backup sets allow you to define multiple rotations for your Robot Reports archive backup, providing flexibility to your archiving strategy. For example, each rotation might include archived reports for a period of time, such as a week or month. In addition, using Robot SAVE to archive your reports allows the reports to span multiple volumes, making it easier to archive large reports and minimizing the time necessary to complete the archive. This topic describes how to create the backup class and backup sets in Robot Save, allowing you to archive your Robot Reports reports using Robot Save. Note: Do not delete any current Robot Save backup classes and sets that you’ve used to save your Robot Reports archive in the past. You will need them to restore any reports that already are archived. If you use Robot Save R10M17 with Robot Reports R07M21 or higher, the RBSMRKVOL command is no longer valid. You do not need to mark volumes as full. Remove this command from any CL programs or jobs that currently use it to mark tape volumes as full. If you run a job or program that contains the command, the job will end with the following error message: RS86103, Command RBSMRKVOL is no longer valid. A new command, REPCHGROT (Change rotation in Robot Save), added in Robot Reports R07M21, replaces the RBSMRKVOL command. The REPCHGROT command changes the backup set rotation used for the archive, which automatically starts the next archive backup on a different volume. For this example, assume you have set up an archiving strategy that uses one rotation per month. Each month, all of that month’s reports will be archived on tape volumes belonging to the rotation. Robot Save will archive the reports using as many tape volumes as necessary, including multiple volumes for large reports that span tapes. Robot Save will continue to attach volumes to the current rotation until the end of the month. At the beginning of the next month, run the REPCHGROT command to start a new rotation and begin archiving on a new tape volume. Determining the number of rotations. To determine how many rotations you need to define to your Robot Save backup set, decide the number of rotations you need each year and the number of years of rotations you want to keep. In this example, one rotation per month equals 12 rotations per year. If you need to keep reports for seven years, set up your backup sets with 84 rotations (12 rotations/year x 7 years). Each month, run the REPCHGROT command to change to the next rotation (*NEXT). At the end of 7 years (84 rotations), you can begin expiring the reports archived on the first rotation. At that time, you can start the cycle over again using the REPCHGROT command to specify the first rotation (*FIRST). Note: Robot Save doesn't automatically remove expired permanent tapes. Therefore, you'll have to remove the volumes from Robot Save. See Using the REPCHGROT Command, later in this topic, for more information. Robot Save uses backup classes, backup sets, rotations, and volumes to archive your reports. To archive your Robot Reports reports, you must define a Robot Save backup class with a Usage type of Robot Reports, and its associated backup sets. 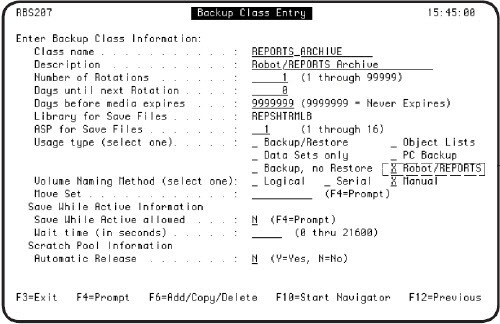 In Robot Save, display the Backup Class Entry panel. Use this panel to define the backup class. Specify a backup class name and description. Select Robot Reports as the backup class Usage type. Note: The number of rotations specified on the Backup Class Entry panel will be overridden when you define your backup sets. Select a Usage type of Robot Reports for the backup class. Display the Backup Set Information panel to define the backup sets for your reports. Define backup sets for both your short-term and long term archives. Enter a name and description for the backup set. Enter the number of rotations you want to define to the backup set. Make sure the Save file data field is set to Y to prevent data loss. After you’ve defined your backup sets, go to the Robot ReportsSystem Defaults panel and enter the names of the new backup class and short- and long-term backup sets. Robot Save will use as many volumes as necessary to complete the archive. When it’s time to change to the next backup set rotation, run the REPCHGROT command by scheduling it in a Robot Schedule job or from a command line. 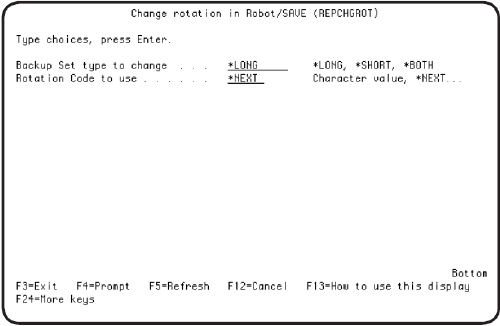 The REPCHGROT (Change rotation in Robot Save) command changes the rotation used by your backup set. Run this command when you want to change your archive to the next rotation, for example, at the beginning of each month. Note: If you specify a previous rotation, Robot Save will append the reports to the last tape used for that rotation.